Human Kinetics Publishers, 9781450400244, 276pp. With more asanas, vinyasas, full-color anatomical illustrations, and in-depth information, the second edition of YogaAnatomy provides you with a deeper understanding of the structures and principles underlying each movement and of yoga itself. From breathing to inversions to standing poses, see how specific muscles respond to the movements of the joints; how alterations of a pose can enhance or reduce effectiveness; and how the spine, breathing, and body position are all fundamentally linked. Whether you are just beginning your journey or have been practicing yoga for years, Yoga Anatomy will be an invaluable resource--one that allows you to see each movement in an entirely new light. 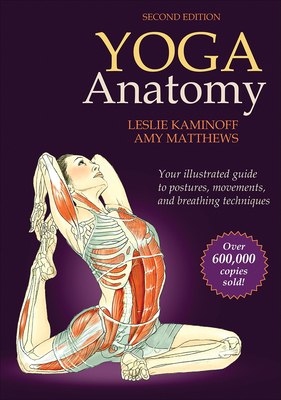 With Yoga Anatomy, Second Edition, authors Leslie Kaminoff and Amy Matthews, both internationally recognized experts and teachers in anatomy, breathing, and bodywork, have created the ultimate reference for yoga practitioners, instructors, and enthusiasts alike. Leslie Kaminoff is a yoga educator inspired by the tradition of T.K.V. Desikachar, one of the world's foremost authorities on the therapeutic uses of yoga. Leslie is the founder of The Breathing Project, a New York City educational nonprofit organization dedicated to the teaching of individualized breath-centered yoga. An internationally recognized specialist with over 32 years' experience in the fields of yoga and breath anatomy, Kaminoff has led workshops for many of the leading yoga associations, schools, and training programs in the United States. He has also helped to organize international yoga conferences and has actively participated in the ongoing national debate regarding certification standards for yoga teachers and therapists. Kaminoff has been a featured yoga expert in publications such as Yoga Journal and The New York Times, as well as online at WebMD, FoxNews Online, and Health.com. He is the founder of the highly respected international yoga blog eSutra, coauthor of the best-selling first edition of Yoga Anatomy, and creator of the DVD Breath-Centered Yoga with Leslie Kaminoff and the highly successful online course yogaanatomy.net. He resides in New York City and Great Barrington, Massachusetts. Amy Matthews has been teaching movement since 1994. She is a certified Laban movement analyst, a Body-Mind Centering teacher, and an infant developmental movement educator. She is registered with ISMETA (International Somatic Movement Education and Therapy Association) as a somatic movement therapist and educator, and with IAYT (International Association of Yoga Therapists). Matthews coteaches the Body-Mind Centering and yoga programs in California and New York City for the School for Body-Mind Centering. She was on the faculty of the Laban/Bartenieff Institute of Movement Studies for 10 years. Together, Matthews and Kaminoff lead The Breathing Project's advanced studies program for movement professionals committed to extending their professional skills and knowledge. Matthews integrates somatic practices and yoga in her private practice as a movement educator, and she teaches embodied anatomy and movement workshops for programs in the United States, Canada, Israel, Ireland, England, Slovakia, Switzerland, and Japan. Matthews coauthored the first edition of Yoga Anatomy. She currently resides in New York City.